Take care of your prized plants and grow your own food such as delicious tomatoes in style with the fantastic, 6′ x 6′ Traditional Potting Shed 6′ Gable. 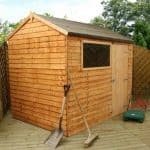 With its just sleek and gorgeous design, this is a shed that is going to really stand out in any garden it is placed in. 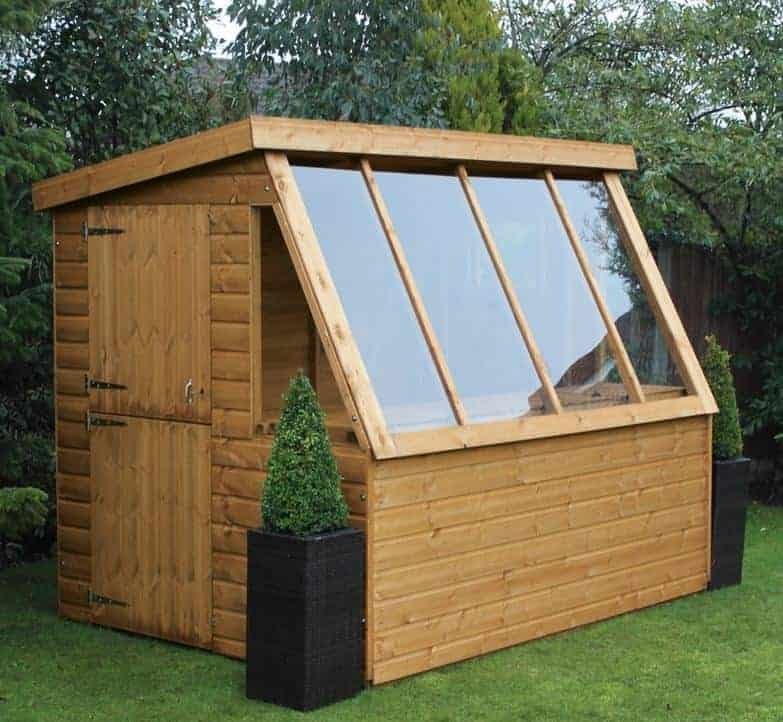 Not only is this a shed which is very attractive, but it is also very practical as it has large windows that are going to let in lots of sunlight and it comes with a workbench that fits in right under those windows so that your plants and vegetables can get all the sun they need. The windows on the side of the shed actually open so you can let in a little fresh air if you are spending a lot of time inside here. Its compact design means that it is going to be able to slot into pretty much any size of garden. While this is a shed that is clearly very attractive it is also incredibly robust thanks to being made with top of the line materials. Keeping the whole structure together is a very thick and strong frame that is covered with some lovely looking, but also waterproof, tongue and groove shiplap cladding. The apex roof is made with tongue and groove boards and is covered with some impressive roofing felt and the floor is going to feel very sturdy under your feet thanks to being made with tongue and groove boards just like the roof. 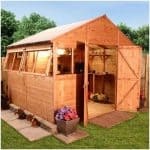 For you people who really love to look after plants, maybe grow your own food and like to have a little place you can potter around in then this shed is for you. While this is one of the smaller sheds in this line, it is still a lot of fun and has many uses. It has a fantastic work bench included so you have a place to keep plants in the sunlight. Inside the shed it is 6 feet in its width and depth. This is on the small side, but if you are careful with how you store things, you will find it is enough room, plus this size makes this ideal for gardens that are lacking in space. The height of this shed is very impressive, especially when you consider its overall size. The eaves height is 6 feet while the ridge is 6 feet 6 inches high. The roof on this shed is very interesting in that this is technically what you would call an apex roof, but it does have a style all to its own. On the very top we have heavy duty roofing felt that is protecting 12 mm thick tongue and groove boards. The roof is really is impressive in every way and it is going to keep the things you have inside very dry. This is a shed that has a very smooth and classy look and this is because of the redwood that has been used for the 12 mm tongue and groove shiplap cladding. It really does look nice and it is designed well enough so that no water can get through it. We have seen Treetops Traditional use this style of cladding before and it always has impressed us. Despite the very pleasant looking design this is still one very tough shed that is built to last. The frame inside this is going to keep the shed solid for many years. It is made from redwood just like the cladding and it is 44 mm x 27 mm in its size. This is one of the most robust frames out there and it is made more stylish and a little bit stronger thanks to its rounded edges. So that you can store many heavy things inside and also so that you can walk around easily, Treetops Traditional have used some very impressively strong materials for the floor. The floor is made with 12 mm tongue and groove boards and these really will allow you to put many heavy items in here. Also while you are walking around this type of floor feels far more solid under your feet than solid sheet boarding. A coating of wood treatment will be required shortly after you have built the shed. A new coat once a year will keep the wood looking amazing and protect it from rot and decay. One thing we must mention is how the shed is given a free dip treatment before it is sent your way. This dip treatment will look after the wood while it is being delivered, but it is not a long term form of treatment. 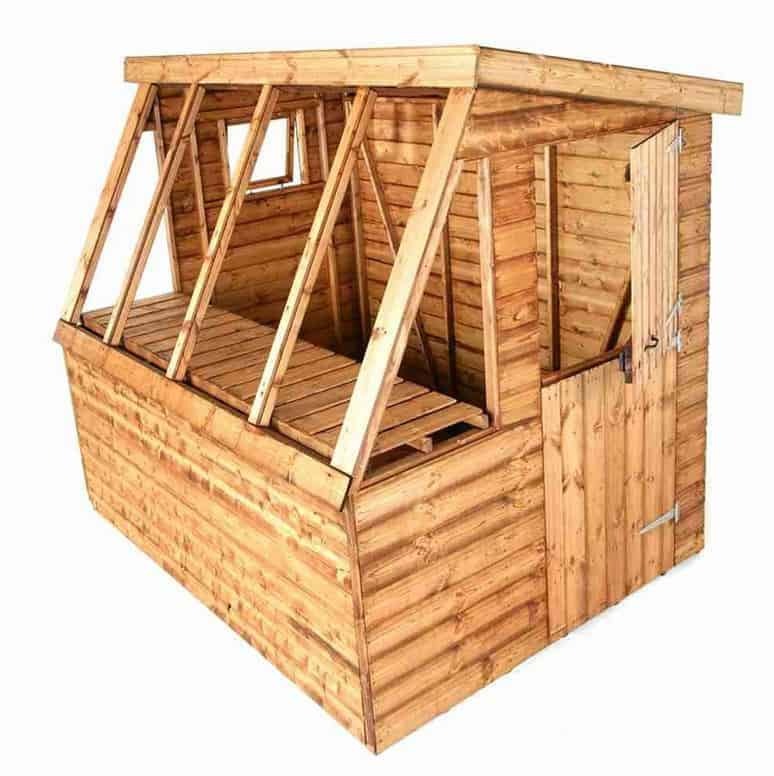 The 6′ x 6′ Traditional Potting Shed 6′ Gable comes with a one year guarantee. This is the standard guarantee that, Treetops Traditional give with all their sheds. We really do like what they have done with the door here. Rather than use a normal style door, they have gone for a really cool looking, stable style door. 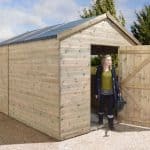 This is large enough so that you can get your things in and out easily, but it is also a stand out feature of the shed thanks to its awesome design. A stable style door is in two parts and incredibly each part is held in place with two high quality door hinges. Most probably the first thing you noticed when you looked at the pictures of this shed was the amazing windows. These make up the majority of the front of the shed and they are made with some very strong horticultural glass. These windows are positioned so that anything you place on the included workbench will get lots of sun to help them grow. On the sides of the shed there are some extra windows and these one can actually be opened. We greatly appreciate how Treetops Traditional actually put a proper lock on their shed doors. This saves you the time and money of getting a padlock and putting that on. In general the whole shed has a very secure feel to it and we are confident that you will have no security concerns at all. This line of sheds does not really offer any kind of privacy because of the large windows, but to be fair this is a shed that is all about looking after plants and growing your own food so we really cannot put it down for a lack of privacy. The door can be placed at either end of the shed which is great as it means you can make sure the shed can fit in your garden properly. Also you can buy wood treatment in a variety of different colours so that would be one way to customise the shed and also protect the wood. If you want to raise the shed a little bit of the floor and want to give the floor just a little bit more robustness then there is a set of wooden floor bearers that you can add to the shed. At £27.99, we do feel that these are actually fairly priced. An installation service is also available at a cost of £99.99. There honestly is not anything that we would have changed on this shed it is very well made from the bottom to the top. Treetops Traditional have selected these materials mainly because of how long they will last. 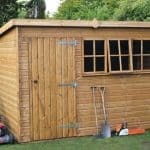 True you will have to give it a coating of treatment once a year, but by doing this the shed will stay rot free and be something you can use for many years. 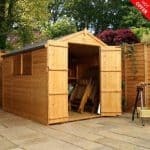 This is a rather small shed so some clever planning on your part will have to be done in order to really get the most out of the space available to you. As this is a smaller sized shed, you and a friend should take 3-5 hours to build this and not really have a stressful time doing so. 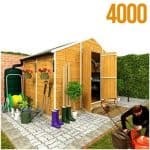 Look we do love the whole design of this shed, but the one slightly larger than this we feel does offer better value for money, but if space in your garden is a premium then you may want to go for this smaller version. Final Thoughts: This is one of the best looking sheds that we have seen from Treetops Traditional. We love the way the roof and the windows connect, the look of the cladding and then of course there is the fact the whole thing is just so robust that it is going to give you many years of enjoyment. The 6' x 6' Traditional Potting Shed 6' Gable is on the small size which does make it perfect for gardens that do not have a lot of space, but we do have to question the asking price considering the space it is giving you. Still if you do have a small garden, but really want a classy area to do some gardening then this is worth taking a closer look at.